Amulet boxes such as these were worn around the neck as protective devices. This stunning example is of high-grade silver with a front that is decorated with dozens of bands finely worked silver filigree, applied sun-motif disks and various geometric silver lozenges. Overall, the box is an exceptionally fine example of what is most probably Jewish silver-work made for local Islamic tastes. Seven cabochon agate or carnelian pendants have been hung from the base of the amulet which in turn is suspended from a chain of 12 polished agate beads and 12 silver beads with applied granular work and strung on a brown woollen cord threaded through an incised white metal toggle. The roughly-hewn agate/carnelian pendants lend much charm to the overall aesthetic of the piece. (Carnelian was the stone that the Prophet Mohammed reputedly wore mounted in a ring.) These, like the beads, also have clear age. The first silver bead on either side is has applied silver grains of barley motifs – a recurring motif in Yemenite jewellery and are archaic symbols of fertility. The Israel Museum in Jerusalem has a string of such beads which it describes as a necklace worn by Jewish brides in San’a, Yemen. As elsewhere, the art of silver-smithing in Yemen became an almost exclusively Jewish occupation. Boxes such as these were worn in Saudi Arabia, Oman and Yemen. Amulet boxes are also important in the Maghreb. Christie’s in London had a gold example attributed to Saudi Arabia at its ‘Islamic Art and Manuscripts’ auction of October 12, 2004 (lot 157 – price realised: 8,365 pounds). 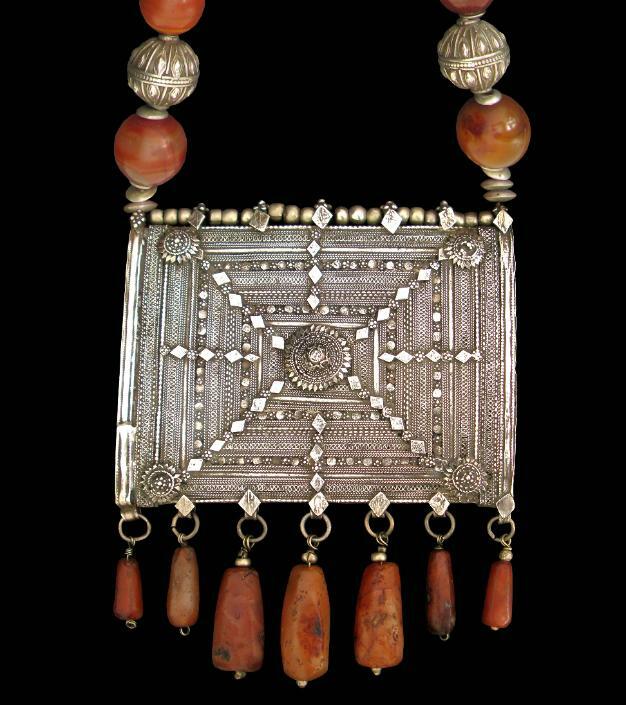 It is not surprising that amulet boxes should be sourced from across northern Africa and the Middle East given the migration of Jewish silver and gold smiths, the nomadic nature of many of the communities in the area and the long history of exchange and commerce across the region. Saad al-Jadir, Arab & Islamic Silver, Stacey International, 1981; Rajab, J., ‘Silver Jewellery of the Sultanate of Oman, Arts of Asia, July-August 1994; Splendeurs du Maroc, Musee Royal de l’Afrique Central, Belgium, 1998; Hoek, C. et al, Ethnic Jewellery from Africa, Asia and Pacific Islands, The Pepin Press, 2004; and The Israel Museum Jerusalem, Harry N Abrams, 2005.